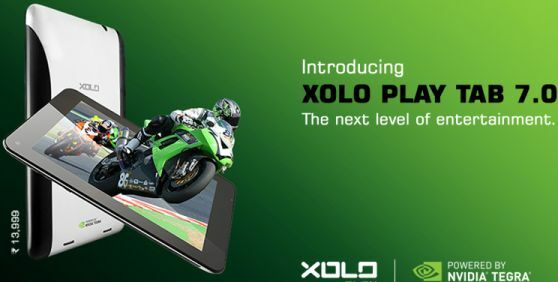 Xolo has launched its first Tegra 3 processor powered tablet called Xolo Play Tab 7.0 in india. The company already launched its frist Xolo Tab 8 with 3G voice calling last month and now released second one without 3G voice calling. The Xolo Play Tab 7.0 features a 7-inch IPS LCD display with the resolution of 1280x800 pixels. The tablet runs on Android 4.1 Jelly Bean operating system and powered by 1.2 GHz quad-core Nvidia Tegra 3 Processor. Xolo Play Tab 7.0 comes with 1 GB of RAM, 8 GB of inbuilt memory and external memory up to 32 GB. The device sports 2 MP front facing camera but there is no rear camera. It has the connectivity of Wi-Fi, Bluetooth 4.0 and microUSB. It packs with 4000 mAh Li-Po battery that provides 8 hours music playback time. It also has HD playback of videos and Nvidia Tegra games support through Tegra Zone similar to Xolo Play Tab 8.0. Xolo Play Tab 7.0 will give you best performance for gaming and it's first tablet in Play series after the Xolo Play T1000 smartphone. It is priced at Rs.12999 and it will be available on retail stores across India from this week.